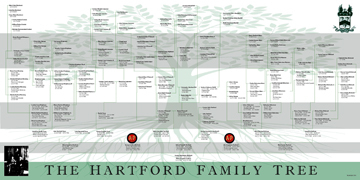 The 2011 Hartford Family Tree has grown. Prints are 44"wide x 23"high. These "posters" can only be mailed in a tube. Please contact Avis Anderson with your order, and as always contact her with any additions to our tree. H.F.F. 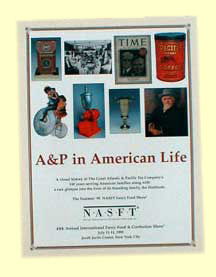 maintains an archive of photographs of Hartford Family members and classic shots of A&P stores and products. They range from as far back as the 1870's through the 1960's. For a complete list of available images and usage fees, contact Executive Director, Avis H. Anderson. 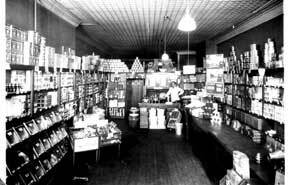 A full color, 32 page catalog which tells the story of the Hartfords and their grocery business through words & pictures in available for $10.00. Notecards featuring a photograph of George Huntington & Josephine Hartford's 50th Wedding Anniversary Celebration in 1911 are available in packs of 12 for $15.00. Christmas Cards featuring a lovely image from an 1880's A&P Trade Card are available in packs of 12 for $15.00. 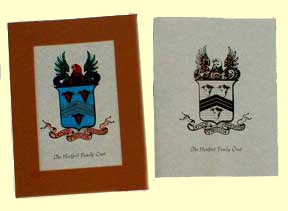 8.5" x 11" Hartford Family Crests, suitable for framing are available for $10.00. Prices of all items includes domestic shipping. To order, simply call the H.F.F. offices at (732) 222-0330. 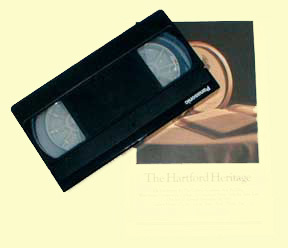 ©1983-2013 The Hartford Family Foundation. All rights reserved. Page last modified July 2013.